SIMPLETEC Automatic Assembly Line Press are offered in various configurations having capacities from 20T to 500T and higher. All operations loading/up-loading of coponents, are automatic machines can be equipped with automatic component transfer machanism, orientation unit, inspectation/gauging system, weighing system, packing unit, etc. SIMPLETEC 75T Automatic Assembly Line Pressis widely used for assembly of big size taper roller bearings. For high productivity, the ram approach speed is 140mm/sec and return speed is 150 mm/sec. Simpletec Automatics Pvt. Ltd. is the flag ship company of Simpletec Group of Industries. Simpletec Automatics Pvt. Ltd. was started in the year 1994 by Mr. M Saha Talukdar and Ms. Monika Saha Talukdar to manufacture custom built machines. 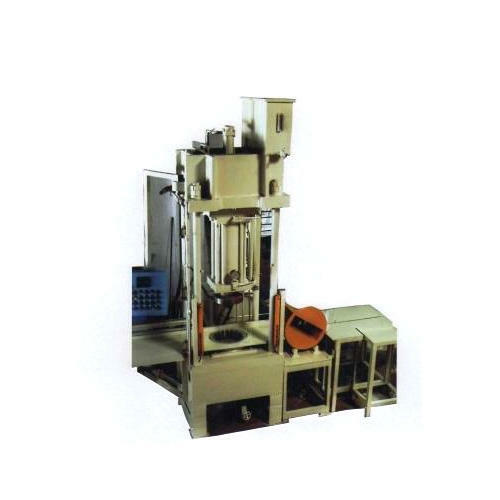 Within few years the company became known through the World as a reputed manufacturer of very special machines like Hydraulic Pressure Testing Machines, Undercarriage Track Machinery and Track Presses, Railway Track Machinery, Hydraulic and Pneumatic Quench Presses, Automatic Pressure Gelation Machines etc. Simpletec has been receiving regular repeat orders from reputed industries and multinational companies throughout India and from giant organizations in Mexico, France, Australia, Israel, Saudi Arabia, Lebanon, Peru etc. Simpletec machines are of robust design, highly productive and easy to operate. ‘Simple Automation and Sound Performance’ is the core designing and manufacturing concept of the company. Simpletec machines are unbeatable in price and quality. Prices have changed only marginally in last 17 years. Strong marketing strategy is maintained through careful implementation of Just In Time Production System and near zero rejection through strong Quality Control Systems. Simpletec has long term Manufacturing Partnership Agreement with giant Government and Private/Public Sector Organizations to design, manufacture and supply machineries, hitherto not manufacture in the country.